Microsoft's new flagship is here – accompanied by a larger version of itself. That's right, Microsoft pulled an iPhone 6 / 6 Plus — or a Nexus 5X / 6P, whichever sounds better to you — and introduced its top-of-the-line Lumia 950 and its bigger sibling – the Lumia 950 XL. Thus far this year, we've seen some hard-hitters, in the face of Samsung's Galaxy S6 series, the new Xperia Z5 devices, and Google's Nexuses, not to mention the update of Apple's iPhone 6 – the iPhone 6s. 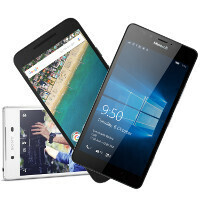 So, with that being said, let's check out how the Microsoft Lumia 950 stacks up against two of the other new kids on the block – the Google Nexus 5X and Sony Xperia Z5. Of course, that's just a preliminery look – we can't wait to get some in-depth time with the new devices! 950 is using wp os, amoled and snap 808, it should have longer standby time than z5 right? I hope it's not going to be on the final record if it's already reviewed because I really want this as my new lumia phone.